This book provides a detailed survey of the law relating to public interest disclosure. It examines how the new system has developed since the coming into force of the Public Interest Disclosure Act 1998 (PIDA), and provides up-to-date practical guidance on the key issues that arise in practice. Analysing the legal framework in the area, both under PIDA and the disparate sources of law that can apply, it provides in-depth commentary on case law and legislative developments. It examines the structure of PIDA, litigation procedure and remedies under the Act, data protection, confidentiality, copyright, defamation issues, and the Human Rights Act 1998, as well as the contractual and fiduciary duties of employees, statutory obligations (both regulatory and criminal), and the Corporate Governance Codes. 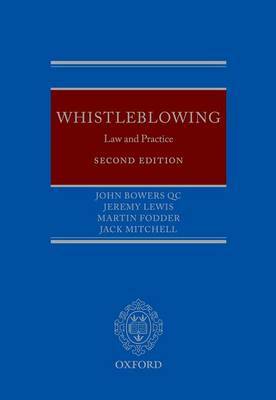 Since the publication of the first edition, there have been substantial developments in the area, including those regarding whether a disclosure tends to show a Public Interest Disclosure, the burden of proof, remedies, and alternative dispute resolution. This new edition also covers the employment tribunals' new powers to pass PIDA claims to the appropriate regulator, where the claimant consents, and provides extensive coverage of a number of important decisions emerging from the Court of Appeal and the Employment Appeal Tribunal, including Babula v Waltham Forest College, Ezsias v North Glamorgan NHS Trust and Fecitt and others v NHS Manchester. Written by an author team with extensive experience in the area, and making use of checklists and worked examples, the book is an essential reference work for employment practitioners dealing with cases involving public interest disclosure issues. It will also be of interest to private and public sector employers seeking guidance on whistleblowing procedures and policies.